You are having issues with tax liens on your property. I get it. We help people through these tough situations every day. Selling a house for most is already a complex process. When you want to sell a house with a lien on it, the process can become even more complex. The more you know about selling a house with a lien and the options available, the easier the home selling experience can be. Sometimes it helps to have an expert with experience on your side. What are Property Tax Liens on My House? Simply put, it’s a document filed with the county government alerting the general public that you have unpaid debt. If the property is sold, the government debt you owe will be paid and you’ll get the rest of the money. The types of tax liens vary. You could have a federal tax lien on your house, but you could also have a state tax lien or a tax lien from your county or city. There‘s also the “super lien,” which involves being behind on homeowner association fees. And you aren’t alone if you have a tax lien: In the fiscal year 2012, the IRS filed over 708,000 Notices of Federal Tax Liens. How Long Can Property Taxes Go Unpaid? The quick and dirty answer is that they can’t. As soon as you miss the payment, you will begin accruing late fees and penalties. Wait long enough and the state will sell your home to pay off the unpaid property taxes. foreclose the lien in court and then sell the home. Nonjudicial tax sales since that is the most common type of tax sale process in Georgia. If you are struggling to pay your property taxes, learn about your options to avoid a tax sale. Before the sale, you’ll get three notices. The sheriff must also publish a notice in a newspaper. If you don’t pay the taxes, you’ll get a letter from the tax collector stating that you are behind and giving you 30 days to get caught up. If you don’t pay, you’ll get a notice by personal delivery, registered mail, or overnight delivery 20 days before the sheriff publishes notice of the sale in a newspaper. Then, you’ll get one more notice by registered or certified mail or overnight delivery ten days before the sale. At the sale, the sheriff sells the home to the highest bidder. If no one bids an amount sufficient to cover the past-due amounts including costs, the county may bid and purchase the home. After the sale, the high bidder (the purchaser) gets a deed to the home. Can You Sell a Property With a Lien On It? To sell your house with a Realtor, it’s best to have a clear title, meaning you should pay off your property taxes before you can sell. With clear title, you are free to sell your property. If several months have passed since you paid the lien, go back to the county clerk and search again. Unless there is a severe delay or other unforeseen issues, you can show the buyer your property is clear. Many people are wary of buying a home if there’s a lien on it. In fact, liens are a complication most people don’t want to deal with. And liens can be a real dealbreaker. This requires a great realtor who is skilled at securing lien releases and soothing the fears of would-be buyers. It’s important to have someone who is skillful at negotiation. Working with a Realtor who is not experienced with selling properties that have liens can leave your house going unsold, racking up liens amounts, and potentially leaving you to foreclosure. Don’t leave your future up to chance. Fill out the form below to work with a company that’s experienced with buying homes with property liens. At Breyer Home Buyers, we buy your house direct, we negotiate and pay off the liens for you, leaving you with more money at the closing table. If you want to move, but have a lien on your house, you still have options. A house can be sold “as is” when there is a lien or judgment against the property or seller. We’ve walked hundreds of homeowners through the whole process, from educating about liens to selling a property with liens, so we know from experience: every title problem is solvable. All you need is a little imagination and a lot of practice. Even if the debt exceeds the property value, you can still sell a house with a lien on it. First, start with an expert who can contact the lien holder to negotiate for a partial or full release of the lien. Judgments from creditors are rarely set in stone. Smart lien-holders will always take something rather than nothing. You just need to ensure you know your rights and that you don’t give creditors more information than they need. You don’t have to pay these settlements before closing—liens against houses can be paid in multiple ways. Traditionally, a seller will pay these debts at closing where the debts are deducted from the proceeds of the sale. This means that you likely won’t have to pay any upfront costs; if you find the right title experts, you can even negotiate with your creditors to secure a full or partial release of the lien, even when settling the liens for pennies on the dollar. An expert makes an important difference in the result. An experienced investor or title company can guide what you say to creditors when settling liens. Don’t provide the lien holder with too much information. Letting them know that you’re considering selling will eliminate your negotiating power as they will know that they can wait until closing to get their money. It’s often best to not tell the lien holder that you need to release to sell a house because that gives them the upper hand. Other times, you do want them to know this information because they will wait for the settlement payment, knowing it will come from closing proceeds. Knowing the right things to say without having experience in these conversations is difficult, so finding the right professional to help is critical. How Long Does a Lien Stay On Your Property? State tax liens don’t expire, and the only way to get rid of them is to pay the amount owed—otherwise when you sell your home, the state will collect the amount owed from the proceeds of the sale. The lien continues until it is paid, or it expires. Generally, the IRS has ten years to collect after it is assessed. The IRS can extend the ten years under two different circumstances. How Do You Get a Lien Removed From Your Property? A lien against your property will prevent you from selling it until that debt is paid. Here are the steps to take to remove the claim of the lien holder against your property. Make sure the debt the lien represents is valid. If you don’t believe you owe the debt to which the lien is attached, you may want to consult with an attorney. Pay off the debt. If the debt is valid, pay the creditor in full. If you work with an attorney, you may be able to negotiate a lower payoff amount. Fill out a release-of-lien form. You can often find lien release paperwork online. If not, try the county clerk’s office or an attorney, if you have one. Make sure the form includes your name, the lien holder’s name, proof and amount of the debt paid, and a description and address for the property. Have the lien holder sign the release-of-lien form in front of a notary. The lien holder needs to sign the document in the presence of a notary public. File the lien release form. You’ll usually file the lien release at the county recorder’s office, at which point it becomes public record. You may have to pay a small fee to file. Ask for a lien waiver, if appropriate. A lien waiver is a document from a contractor showing that you have paid for the work in full and waiving all future lien rights of the contractor in the work or equipment. Keep a copy. You’ll want to have a copy of the release form for your records. What Happens if Property Taxes are Late? After a set period of time – typically anywhere from six months to two years, depending on where you live – if your taxes are still unpaid the taxing authority’s tax lien gives them the right to foreclose on your property. Your home then gets sold at an auction to anyone willing to pay off the back taxes due. Can You Lose Your House if You Don’t Pay Property Tax? Even if you have paid off your mortgage, you still have to keep on top of property taxes. As property taxes rise, this can be difficult, but falling behind on payments can have serious consequences. In addition to racking up penalties and fines, missing a property tax payment can cause you to lose your home. If a homeowner doesn’t pay his or her property taxes, the government will put a tax lien on the property. The government may then sell the lien to an investor who is entitled to collect the debt along with penalties and interest. If the homeowner can’t or won’t pay up, the investor can foreclose on the house and then sell it for a large profit. In a booming housing market, this type of investment can be very popular. Unfortunately, low-income elderly individuals are often the victims in these investment schemes. It doesn’t matter how small the tax bill is; the government can get a lien on even the smallest tax bill. Keep an eye out for property tax bills and pay them on time. If you don’t remember ever receiving a property tax bill, you should check with the county to make sure you don’t owe any taxes. If you can’t afford to pay property taxes, many states have programs to help elderly homeowners with payments. You may be able to pay in installments or defer payments until you sell the house. How Long Can You Not Pay Your Mortgage Before Foreclosure? If you fall behind on mortgage payments, the lender cannot simply evict you. A federal mortgage servicing law that went into effect in 2014 prohibits the bank from starting the foreclosure process in most cases unless the loan is more than 120 days past due. After the 120 days in the foreclosure timeline in Georgia, the bank can pursue foreclosure under state law. This 120-day waiting period gives homeowners the opportunity to apply for a loss mitigation option, such as a loan modification in Georgia. You can learn more about the federal waiting period in Delaying Foreclosure: The Dodd-Frank Act 120-Day Rule. If you miss your first mortgage payment, your lender will typically offer you a grace period of fifteen days. During these fifteen days, you can send in your payment without being considered delinquent. Once this grace period is up, however, you’ll be charged a late fee. This fee is usually a fairly substantial percentage of your mortgage, such as 2 to 5 percent of the monthly payment amount. If you miss your second mortgage payment, your mortgage is likely considered to be in default. At this point, the lender will probably contact you to find out why you haven’t made your payments. You should take the opportunity to explain your situation to your lender and let them know what you’re doing to resolve the situation. Your mortgage servicer will usually become increasingly aggressive about getting paid if you miss your second mortgage payment, but it gets even worse if you continue missing payments. The U.S. Department of Housing and Urban Development advises that it can help to work with a housing counselor at this — or any — point. After you’ve gone about 90 days without making a payment, you’ll receive a demand letter. A demand letter informs you of the amount you are delinquent and that you have 30 days to bring your mortgage current. If you don’t pay the specified amount or make arrangements by the deadline, foreclosure proceedings might begin. You still have time to try to work out an arrangement with your lender, but it’s unlikely that they will take less than the total amount of mortgage payments you owe. If you still can’t make the payments within 90 days, however, it’s game over: The lender will begin the foreclosure process and bring legal action against you. After you’ve missed the deadline provided in the demand letter and you are four months behind on your mortgage payments, the foreclosure process will usually begin. First, you’ll be referred to your lender’s attorneys. As a result of your delinquency, you’ll be required to pay any legal fees during this time. You could still have a chance to avoid foreclosure if you can make your payment or work something out with your lender. Can You Pay Your Property Taxes Monthly? Lenders often roll property taxes into borrowers’ monthly mortgage bills. While private lenders who offer conventional loans are usually not required to do that, the FHA requires all of its borrowers to pay taxes along with their monthly mortgage payments. To determine how much property tax you pay each month, lenders calculate your annual property tax burden and divide that amount by 12. Since their numbers are estimates, some lenders require their borrowers to pay extra money each month in case the property tax payments come up short. If you end up paying more property taxes than you need to, you’ll receive a refund. If you underpay your property taxes, you’ll have to make an additional payment. When you pay property taxes along with your mortgage payment, your lender deposits your property tax payment into an escrow (or impound) account. When your property taxes are due to the county, your lender uses the funds in that escrow account to pay the taxes on your behalf. Both you and your lender should receive a notice from your local tax authority. If you don’t, it’s best to contact your lender and your tax authority to make sure your property taxes are being paid on time. Can I Get Help Paying My Property Taxes? Paying property taxes is part of home ownership, and failure to set aside money throughout the year in order to pay them on time can leave you strapped as the deadline approaches. If you can’t pay the taxes you owe to your local government, you may qualify for a property tax relief program. Contact your local taxing authority to find out if you can arrange a payment plan. You must follow the terms of your agreement and make each payment on time. Otherwise, you may not get another chance to catch up with your back taxes. You will be required to pay future property taxes on time. Ask if your local taxing jurisdiction lowers property taxes for low-income seniors, disabled homeowners and, veterans. Generally, most taxing authorities require you to reapply for tax reduction programs each year. Inquire whether you qualify for a property tax deferral program, in which case the state will pay the deferred portion of your property taxes to your municipal or county government. Under this type of program, the portion of your property taxes that you are responsible for paying is limited to a specified percentage of your annual household income. Submit a request in writing along with financial documentation to the board of abatement for your taxing authority. Depending on the state and taxing jurisdiction where you reside, you may meet the eligibility requirements to have part or all of your property taxes forgiven. Apply for a hardship exemption if your household income is low and you don’t think you’ll be able to pay your property taxes. In most cases, you apply at your local tax assessor’s office. Normally, your household income must be at or below the poverty level for you to qualify for an exemption. Although you can’t usually get a hardship exemption for past due taxes, you may be eligible for an exemption for the current year or future years. See if you qualify for a hardship extension for property taxes you owe that are past due. If you can prove that your household is low income, your taxing jurisdiction may give you more time to pay your delinquent taxes. How to Be Done with My Property? 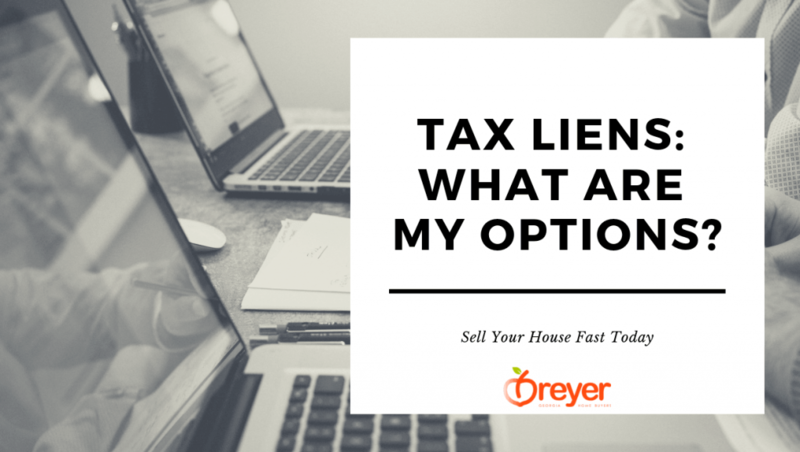 When you need to sell with tax liens on your house, consider working with Breyer Home Buyers. Whether your debt is with the IRS, a credit card company, the tax authority or even an individual, our experience in all types of liens have let homeowners sell fast and move on with life. Selling a house with a lien on it can be messy, but you’re not alone—we can help. Fill out the form below to get a no-obligation offer on your house so that you can relieve the stress of property tax liens and move out. We’ve helped hundreds of people sell their homes and move on with a better life. It’s your turn.